One of the great things about our neighborhood is that an impromptu dinner party can break out at any time. Often, it’s just a matter of cobbling together what everyone has on hand. But last weekend I had a slam-dunk meal in my back pocket. And by ‘back pocket’ I mean freezer. 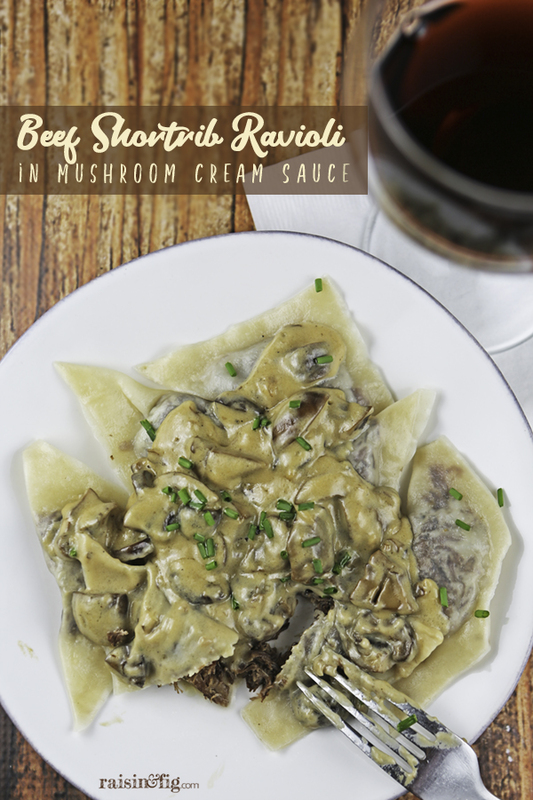 The hard work was already done for this hearty, rich and decadent Beef Shortrib Ravioli with Mustard Cream Sauce. 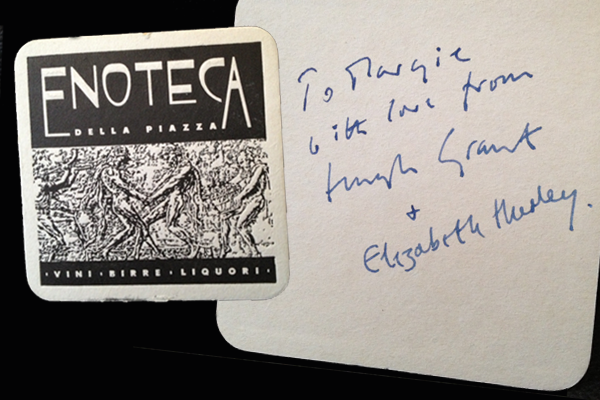 Here’s how that happened: Every year, during the holidays, we host an “interactive” dinner with family and friends. It started with building our own pizzas. The next time, we went with an Asian theme and made homemade potstickers. Then a few years ago, we made homemade ravioli… and it’s become a tradition. This year, the flavors they wanted were Butternut Squash (with a brown butter sauce), Spinach & Ricotta (with a simple tomato sauce) and “something meaty.” This Beef Shortrib Ravioli with Mushroom Cream Sauce now has a permanent place in the repertoire. 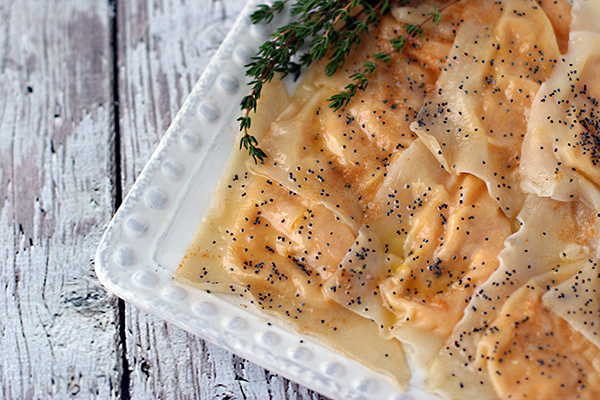 (Another favorite is Beet Ravioli – also served with the brown butter sauce). 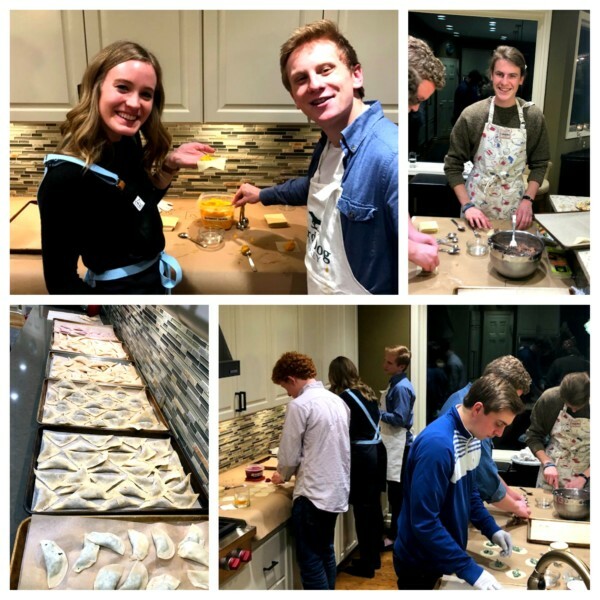 When everyone arrives, we put the kids (young adults, really) to work constructing the ravioli. There are multiple benefits to this approach. First, the adults can pour a festive beverage and “supervise” the dinner prep. Second, the kids not only have a great (and very competitive) time doing it, they learn some cooking skills and gain some kitchen confidence. And finally, with several pair of hands producing the ravioli, there are always plenty left over to freeze for later. No labor force, er, willing kids…? You can make these on your own, and they’re well worth the effort. If you love hanging out in the kitchen, maybe listening to podcasts, your favorite album, or just complete silence, plan ahead. Maybe do it in phases. I’d cook the ribs one day (easy, because you’re using a slow cooker or an instant pot, and most of the time is hands off). Assemble the ravioli the next day and freeze (I’ll be honest… this isn’t hard, but it is time-consuming). I’ve made and rolled out fresh pasta before, but have found that using won ton wrappers (found in the produce section) is a LOT less work – and most people won’t taste the difference! Last, make the sauce on the day you’re serving these. All you need to go with this is a simple salad, and your favorite wine. NOTE: The ribs are absolutely delicious without making into ravioli. Follow the instructions in the recipe “notes” for a delicious gravy. Sprinkle ribs with ½ teaspoon salt and pepper. Heat 1 tablespoon oil in a large skillet over medium-high heat. Add the ribs and cook until browned on all sides, about 5 minutes total. Transfer to a 6-quart or larger slow cooker. Add the remaining 1 tablespoon oil and onion, carrots and celery to the pan; cook, stirring occasionally, until starting to brown, 3 to 5 minutes. Stir in tomato paste, garlic and thyme; cook, stirring, for 1 minute. Add wine and vinegar and cook, scraping up any browned bits, until the liquid is mostly reduced, 3 to 5 minutes. Transfer to the slow cooker and add broth. Cover and cook on High for 4 hours or Low for 8 hours. If using an Insta-Pot follow manufacturer's directions. Reserve 2 cups of the braising liquid. In a pan on medium heat, sauté the shallots and fresh mushrooms in olive oil and butter until golden brown. Season with salt and pepper. Add reserved short rib braising liquid and water from the rehydrated mushrooms. Continue cooking until quantity is reduced by half, about 15 minutes. Add the cream and let simmer until thickened, about 10 minutes. Place about 1 Tbs of shredded ribs on wonton wrapper. Lightly wet edges with water, using a pastry brush or your finger. Fold the wrapper over the filling diagonally, forming a triangle and press the edges to seal. Continue with remaining ribs and wrappers. Cook the ravioli in salted boiling water for 2 to 3 minutes or until the ravioli floats. Serve 5-6 raviolis per person, top with mushroom sauce and garnish with chopped chives. I’ve made these with both boneless and bone-in ribs. (Well trimmed.) Both are equally good. These can also be done in a Dutch oven - 325° for about 4 hours, turning once to cover with sauce. The ribs are also delicious as an entreé without making into ravioli. 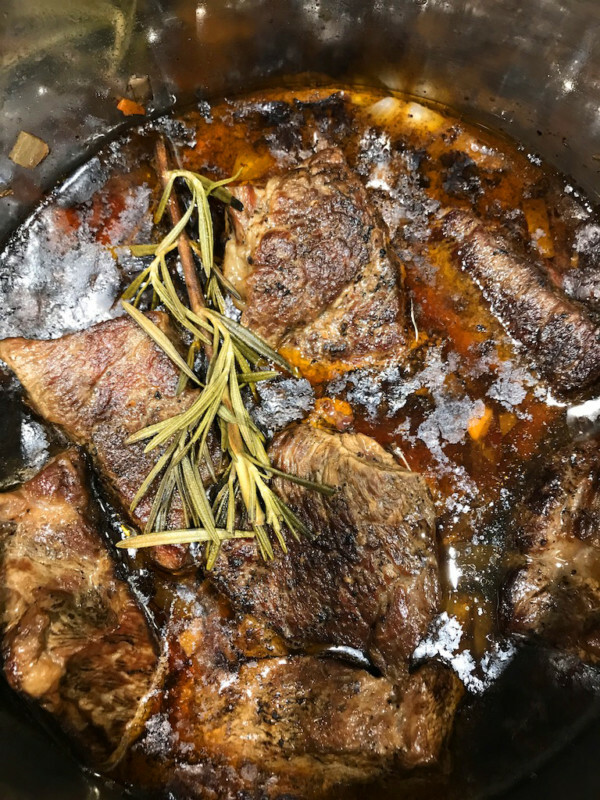 Once the ribs are removed from the cooking pot, follow these instructions for a delicious gravy, and serve on top of mashed potatoes, or polenta: Transfer the liquid to a medium saucepan and bring to a boil over high heat. Whisk cornstarch and water in a small bowl and add to the boiling liquid. Cook, whisking, until thickened, about 2 minutes. Stir in the remaining ¼ teaspoon salt. Season to taste. An alternative way to thicken is to use an immersion blender. This will blend the vegetables into the sauce, creating a gravy. I can attest, not only are these delicious and a crowd pleaser, but it is great way to get adult kids engaged in cooking and have a blast doing it!